The film was nominated for an Academy Award for Best Original Score by composer Lalo Schifrin and Kidder also earned a Saturn Award nomination for Best Actress. A remake was produced in 2005. In the early morning hours on November 13, 1974, Ronald DeFeo Jr. murders his entire family with a shotgun at their home in Amityville, New York. One year later, George and Kathy Lutz, a young married couple, move into the property. George appears not to be strong of faith, but Kathy is a Catholic in name at least. She has three children from her prior marriage: Greg, Matt, and Amy. The couple turn to Father Delaney to quickly bless the home, but Delaney encounters troubles in trying to bless the home, including a room full of flies, out of season; violent stomach sickness; and later, blisters on his palm when trying to make a phone call to Kathy at their home. The experience eventually stops when a door is opened, then a voice whispers "get out". He rushes out of the house when the voice yells at him, and he decides to continue helping the Lutz Family. Delaney experiences more strange events (his car brakes and steering malfunction) and frustrations (lack of support by his superiors in the diocese). He ultimately appears to lose faith, becoming blind and having a breakdown. Kathy's aunt, a nun, comes by the house one afternoon, but becomes violently ill. George begins to be more sullen and angry over perceived cold in the house, and obsesses with splitting logs and keeping the fireplace stoked. Before Kathy's brother's engagement party one night, $1,500 to be used for the caterer inexplicably goes missing in the house. Meanwhile, the babysitter watching Amy for the evening is locked inside a bedroom closet by an unseen force. Further unexplained incidents occur with one the two boys suffering a crushed hand when a sash window falls on it, and Amy having an imaginary friend, Jody, who seems to be of a malevolent nature. Kathy catches a glimpse of two red, swine-like eyes outside the daughter's second-story bedroom window. Even the family dog obsesses over a secret room in the basement. George's land surveying business begins to suffer with his lack of attendance, and his partner grows concerned. His business partner's wife, very sensitive to the paranormal, is both repulsed and intrigued by the things she feels when at the house. Throughout the strange incidents, Kathy observes George's persistent waking up at 3:15 a.m., feeling he must go check on the boathouse. She also has nightmares, in which she is given details about the killings of the home's prior family. Research at the library and county records office suggest that the house is built atop a Shinnecock burial ground and that a known Satanic worshipper named John Ketchum had once lived on the land. She also discovers the news clippings about the DeFeo murders and notices Ronald DeFeo's striking resemblance to George. Finally, the paranormal events culminate one stormy night and drive the family to flee, abandoning their home and belongings. The final titles reads: "George and Kathleen Lutz and their family never reclaimed their house or their personal belongings. Today they live in another state." Producer Samuel Z. Arkoff purchased the rights to the Anson novel by Jay Anson, which was a commercial success upon its publication in 1977. Anson himself wrote a screenplay based on his work, but the script was rejected by Arkoff, and screenwriter Sandor Stern was assigned to write an entirely new script. Initially, the film had been conceived as a made-for-television film. Brolin was hesitant when first offered the role of George Lutz. At the time of his casting, the script was unfinished, and so Brolin obtained a copy of Anson's novel to read. Brolin started the book and read until two o'clock in the morning. He had hung up a pair of his pants in the room earlier and during an especially tense passage of the book, the pants fell to the floor. Brolin jumped from his chair in fright. It was then that Brolin decided to do the film, convinced that the material would make an effective film. Kidder was cast in the role of Kathy Lutz after her breakthrough performance as Lois Lane in Superman the year prior. 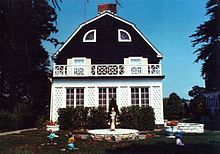 The on-location scenes of The Amityville Horror were filmed at a private residence in Toms River, New Jersey, which had been converted to look like the 112 Ocean Avenue home after authorities in Amityville denied permission for filming on the actual location. Exterior scenes were also filmed in Toms River and Point Pleasant Beach. Local police and ambulance workers would play extras in the film, while the Toms River Volunteer Fire Company was used to provide the rain during several scenes. Indoor shots were filmed at the MGM studio lot in Los Angeles, California. The film shoot was widely publicized in national media when the studio attempted to concoct stories of "unusual" occurrences on the set (not dissimilar from what was claimed to have occurred during the filming of The Exorcist). According to Brolin, he and Kidder were both asked by the studio and the press, "'Is there weird stuff going on?'... and we were looking for stuff now. We'd have liked to tell them, 'Oh yeah, you wouldn't believe the stuff that happened yesterday—my lunch fell off the table in my lap.'" Lalo Schifrin's score for The Amityville Horror was nominated for an Academy Award for Best Original Score, but lost out to the score for A Little Romance by Georges Delerue. It is sometimes claimed that this score was the one rejected in 1973 for The Exorcist, but Schifrin has denied this in interviews. The Amityville Horror was released across the United States starting July 27, 1979. In promotion for the film's premiere, stars James Brolin and Margot Kidder visited the actual home at 112 Ocean Avenue, accompanied by the press. Brolin would later reflect that the actual home was much more "condensed" than the location where the film was shot. Both Brolin and Kidder were skeptics of the claims made in the book; "I didn't buy that this really had happened," Kidder would say in a 2005 interview. During the press junkets promoting the film, when asked whether she believed the Lutzes' claims, Kidder purportedly turned to the producers, who responded: "We'll never tell." The Amityville Horror premiered in the United States on July 27, 1979. It was one of the most successful films produced by an independent studio at the time and was the most profitable AIP release since The Born Losers (1968). The film grossed a total of $86,432,520 at the U.S. box office and was the second-highest-grossing film of 1979 in the United States alone. It was the highest-grossing independent film of all time until 1990, when it was surpassed by Teenage Mutant Ninja Turtles. Though a commercial success, the film received generally negative reviews from critics such as Leonard Maltin and Roger Ebert, the latter describing it as "dreary and terminally depressing". Based on 41 reviews, the film has a 27% rating on Rotten Tomatoes with the consensus: "Dull and disappointing, the best that can be said for The Amityville Horror is that it set a low bar for its many sequels and remakes." The film resulted in several lawsuits. In a 2012 retrospective on the film, historian James F. Broderick praised it, writing: "Director Stuart Rosenberg crafted an effective horror movie that succeeds largely because the performers take the over-the-top material seriously... The film is taut, tense, and filled with the bizarre, unsettling events chronicled in the book." 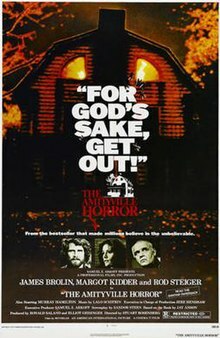 In a 2013 assessment, John Kenneth Muir called The Amityville Horror a "blunt and effective horror film," also noting author Stephen King's analysis of the film's subtext revolving around financial turmoil among the family: "If one follows King's lead, it's easy to contextualize The Amityville Horror as a financial nightmare... Similarly, the movie's dialogue constantly references financial matters. "Bills have to be paid," says one character. "The IRS is calling," warns another. 'They'll nickel and dime you to death" is a mantra not just about the bill collectors, perhaps, but a warning about the demons in the house." ^ "THE AMITYVILLE HORROR (X)". British Board of Film Classification. August 16, 1979. Retrieved March 18, 2014. ^ Arkoff & Turbo 1992, p. 228. ^ Smith 2009, p. 13. ^ a b "The Amityville Horror (1979)". Box Office Mojo. Retrieved March 18, 2014. ^ a b c d e f Broderick 2012, p. 17. ^ a b c d e f g h i Brolin, James; Kidder, Margot (2005). For God's Sake, Get Out! (DVD)|format= requires |url= (help) (Documentary film). Metro-Goldwyn-Mayer. ^ Stark, Ian J. (May 29, 2017). "TV shows, movies set on Long Island but not filmed here". Newsday. Retrieved July 9, 2017. ^ a b Miller, John M. "The Amityville Horror". Turner Classic Movies. In the Know. Retrieved July 14, 2017. ^ Carlsson, Mikael. "Amityville Horror, The". Archived from the original on December 7, 2008. ^ "The Shining (1980)". Boxofficemojo.com. January 1, 1982. Retrieved May 1, 2012. ^ Francis 2013, p. 189. ^ Ebert, Roger (January 1, 1979). "Movie Review: The Amityville Horror (1979)". Chicago Sun-Times. Retrieved May 1, 2012. ^ "The Amityville Horror (1979)". Rotten Tomatoes. Flixster. Retrieved December 26, 2018. ^ Kernan, Michael (September 16, 1979). "The Calamityville Horror". The Washington Post. Retrieved October 31, 2017. ^ Muir 2013, p. 322. Arkoff, Samuel Z.; Turbo, Richard (1992). Flying Through Hollywood By the Seat of My Pants. Birch Lane Press. ISBN 978-1-559-72107-3. Broderick, James F. (2012). Now a Terrifying Motion Picture! : Twenty-Five Classic Works of Horror Adapted from Book to Film. McFarland. ISBN 978-0-786-48957-2. Francis, James Jr. (2013). Remaking Horror: Hollywood's New Reliance on Scares of Old. McFarland. ISBN 978-0-786-47088-4. Muir, John Kenneth (2013). Horror Films FAQ: All That's Left to Know About Slashers, Vampires, Zombies, Aliens, and More. Hal Leonard Corporation. ISBN 978-1-480-36681-7. Smith, Gary A. (2009). The American International Pictures Video Guide. McFarland. ISBN 978-0-786-43309-4.